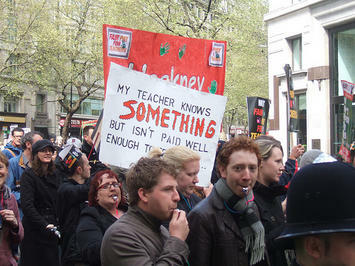 Britain’s public sector workers came out on a one day strike last week over government plans to raid their pension funds. Government ministers did the rounds of television studios denouncing the strikers as mindless militants. Both sides are echoing the class struggles of the Thatcher-era, but the truth is that it’s not the 1980s. My children were off school, and like many children, glad of it. Schools are among the more solid parts of the public sector action today, and in London were struck out, though in the country the teachers’ unions have not achieved the 90 per cent shut down they were aiming for. Unlike the last great wave of union opposition to Conservative spending cuts, back in the 1980s, the teachers’ unions were supported by the National Association of Head Teachers. At the college where I teach, the lecturers in my department were solidly behind the strike, and boldly leafleted and informed students of their decisions in lectures and circulars. Administrative staff, by contrast, crossed the picket lines. Overall the strike is well-supported, but not quite the quantum leap of opposition to the Conservative-Liberal coalition that seemed to be in the air. Those joining the marches were 30,000 in London, and a few thousand in the other major cities, which is many more people than the deracinated petit bourgeois mobilised by the #Occupy camps, but does not compare to the bigger union mobilisations of the 1980s. Union activists have tried to paint the coalition (which they call the ‘Con-Dem’ government) as Margaret Thatcher’s Conservative government of the 1980s reborn. As they see it, some ‘anti-Thatcher’ spirit would give the rank and file more fire in their bellies. Prime Minister Cameron and his ministers have been trying to spark up a Thatcherite spirit, too. It is their only blueprint for handling the challenge of the public sector union revolt. They have been going around the studios denouncing mindless trade union militants in the same way that Thatcher’s ministers Cecil Parkinson and Norman Fowler did back then. But they have not done it very convincingly. Most of all they have failed to get the public to blame the state sector for the budget deficit, as Mrs Thatcher by and large did. The public is just not in the mood to turn on any group of workers with that much anger. It is people in power that are distrusted, newspaper editors and politicians. The specific plan to cut pensions and raise the pension age is not accepted, but widely seen as the chancellor robbing from people’s rightfully earned savings. Chancellor Osborne has failed to persuade many people that they need to take his harsh medicine. It is perhaps typical of the strident Mrs Thatcher that her ghost is haunting the country even though she is still with us, if a little frail. It is a generational thing – anyone over forty either hated or loved Thatcher and by and large it is the ones who hated her who went on to be opinion formers, whether in TV studios, newspapers or teaching in colleges and schools. The under thirties take their idea of the Thatcher era from those teachers, or from the novels of Jonathan Coe, or most recently from the Meryl Streep film. There is a touch of nostalgia for an age that was a bit more black and white, where the choices were starker. Today’s class struggle is by no means as clear. As much as the unions talk up the coalition as a return to Thatcherism there is nothing like the determination to lead an offensive against trade union power in Cameron’s cabinet, which, remember, is a coalition with some sceptical Liberal Democratic partners. What is more, the party he leads got elected on the express promise that it had left the ‘nasty party’ image of the Thatcherite 1980s behind. This was the nice Tory party. Cameron’s one distinctive policy, the Big Society, if it were to work, would surely be carried along by the kind of people who are on strike today – who struck me as people with a social conscience, and an interest in their communities. It cannot be comfortable for him that this is the very constituency that he most offends. Mrs Thatcher was not so bothered about the Social Workers and Community Activists, generally painting them as a big nuisance. What she was good at was rallying the establishment – the newspaper editors, City financiers, industry managers, senior police chiefs and judges were a formidable establishment ready to face down any rebellious mood among the scruff trade unionists or rioting youth. Mr Cameron, though, does not have any such united establishment on his side. They have all been attacking each other for some time now. Right now, Lord Leveson is enquiring into the scurrilous phone tapping done by Rupert Murdoch’s News International. It is a ghoulish picture of the newspaper magnate that emerges, and not the kind of thing that is likely to persuade him to get behind the Cameron government in the way he was behind Mrs Thatcher’s. The left, too, is in a weaker state than it looks. There is a kind of trajectory to events, from the student demonstrations of a year ago, through the summer riots and this autumn’s version of #Occupy Wall Street – a tent city in the gardens of St Paul’s cathedral. The rhythm of these protests – and protest is legitimated emotionally by the events in the Middle East, however different those protests are – give the impression of a rising crescendo. But that is deceptive. The anti-capitalist mood is not deeply rooted. Last week they had an opportunity to make their organisation a bit stronger. But without a concerted assault from the government, the opposition is also a little tentative. Overall the country is much more exercised by the throwaway line from TV presenter Jeremy Clarkson, that the strikers ought to be shot – for which he has been roundly condemned – than it has been by the strikes. On the night Cameron went around the television studios saying that the strikes proved to be a bit of a damp squib. It is a smart spin to put on things. It conveys that he is not rattled, and that it is all a bit of a fuss about nothing. But it is not true enough for him to get away with it. The unions did not land a big punch, but they had a respectable day. Worse still for Cameron is that it sounds like his own strategy is a bit of a damp squib so far.